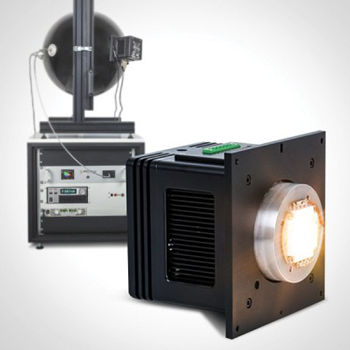 The GL Spectis 6.0 LED spectroradiometer, expands on our family of high-end light spectrometers optimized specifically for production and large laboratory setups for the high speed measurement of SSL products (IESNA LM-79-08), LED wafers, large street lamps and luminaries in accordance with the new global standard CIE S025 standard. Whenever you need to build a complex LED test and measurement setup, this rack mounted spectrometer module is ready. Easily connect with other devices like power supplies, TEC controls, power meters and other peripherals of the instrument system for LED lighting laboratory or production testing. 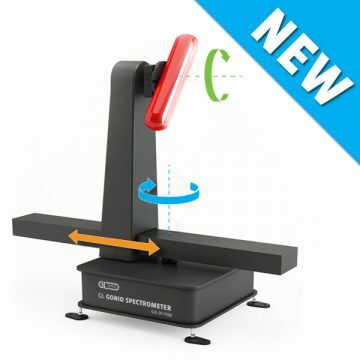 GL Spectis 6.0 LED spectroradiometer uses high resolution optical system covering a very wide spectral range with single sensor and diffraction grating. 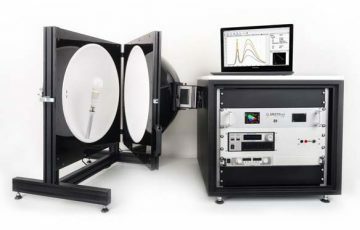 Average optical solution is 3,5 nm and data point interval 0,5nm which makes this a very universal instrument for different types of measurement. Choose the best way to connect and control the system based on project or application requirements. USB or TCP/IP communication can be used for direct data transfer. Additional trigger interface is available for fast testing purposes. Specially designed entrance connector provides high stability and precision for fiber optic connections. Integrating spheres and various options for other optical probes for different types of systems are available. New international standards for LED lighting put additional demand on complete measurement systems which can perform optical test along with the electrical and thermal parameters testers. The GL Spectis 6.0 LED spectroradiometer uses industrial standard 19″ rack housing for easy integration into production testing systems and larger laboratory settings to include power measurement, TEC systems, triggers and other testing devices. Practical industrial rack housing allows for easy connection of complexed measurement systems. Available USB and Serial interface simplifies integration with different types of control software and data systems. With a wide wavelength range from 200 to 1050nm, the Spectis 6.0 allows for measurements in accordance with a number of standards, including Photobiological Safety (IEC EN 62471) or measurement of SSL products (IESNA LM-79-08) and the latest global CIE S025 standard. One device can cover many different types of measurements. Complete measurements in accordance with CIE 127:2007 and CIE 025/E:2015. Photobiological Safety testing of LED Products in accordance with EN 62471. Measure of SSL Products in accordance with (IES) LM-79-08. Ecodesign requirements in accordance with (EU) No 1194/2012. Despite the fact that it is not a cooled detector instrument, the Spects 6.0 is ready to provide very accurate measurements in different conditions. A temperature sensor installed on the electronic board monitors changes in temperature and automatically compensates for any change in dark current level ensuring excellent measurement stability. 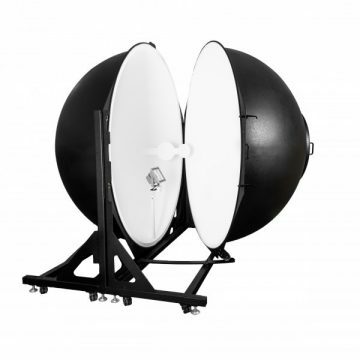 With the universal concept and design of the Spectis 6.0, you can easily expand your measurement system by adding any one of our integrating spheres or additional accessories. The Spectis 6.0 possesses a unique mechanism to detect and automatically load the correct calibration file for that attached accessory. This enables the user to confidently avoid measuring errors when changing accessory interfaces. The calibration meets the requirements of leading standards institutes and is confirmed with a manufacturer’s certification. **Measurement below 1 lx may require customization to obtain noted specification. Please discuss with technical sales. The GL TEC Control System is a new solution designed to help you maintain a stable temperature of your sphere measurements. For luminous flux and radiant power measurement of large luminaries.